Something I found while leafing through old drawings. I drew this ten years ago. 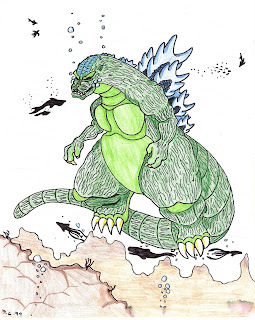 This is clearly the Heisei Godzilla, and is heavily influenced by Arthur Adams' art from the Dark Horse books and the Godzilla Compendium. I've since moved on to the Millenium design, which is my favorite. Awesome. And he is clearly giving a lot of thought as to how best to eat that dolphin and her baby.